Much like our own lives, objects define a nation’s history. That is the simple but profound concept behind the National Treasures project. It has represented a truly unique example of the Irish public’s engagement with their country’s past. It is the first attempt to use a nationwide crowd-sourcing campaign to uncover objects and their stories in order to sketch the tumultuous changes in Irish social, political, cultural and sporting life over the past century. As a lecturer in modern Irish history, working on National Treasures has been a fascinating experience. 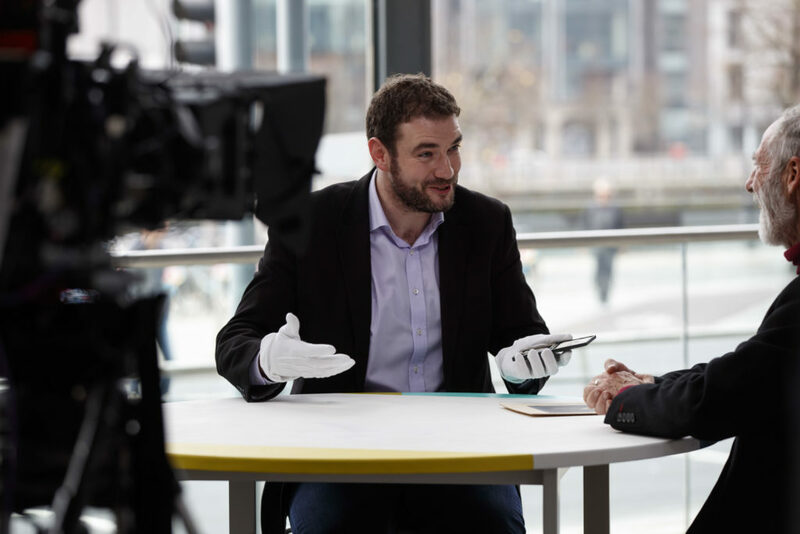 Given that one of my areas of interest is Ireland’s sporting history, I was asked to concentrate on items which would reveal to the viewer the rich tapestry of the nation’s sporting heritage. I am sometimes asked if sport can really be a legitimate subject for understanding our country’s history. The answer is emphatically, yes! Sport does not exist in a vacuum. Rather, it adjusts to and reflects the social, cultural, economic and political climate of any given time. Sport is a wonderful window into Irish society because in this country, sport has always been wrapped up in broader questions of class, gender, economics, religious affiliation and, of course, political identity. The complexities, nuances and contradictions of Irish history are continuously revealed through sport, and sport has been a huge part of the story of Ireland over the last hundred years. Think about it – the numbers of people who have been involved in organised sport, either as participants or spectators, dwarfs those involved in any Irish political or social movement this past century. Quite simply, for a large portion of Irish people, then and now, sport has dominated their conversations and their activity between the hours of work and sleep. 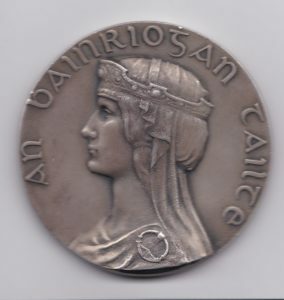 I have always been particularly interested in those moments where Irish sport and politics collide, and for me one of the highlights of filming the National Treasures series was coming across Vincent Delaney’s Tailteann Games Medal from 1928. This object reflects one of the clearest attempts in Irish history to use sport for explicitly political purposes. In August 1924, little more than a year after Ireland’s short but bloody Civil War came to an end, the first Tailteann Games were organised by the ruling Cumann na nGaedheal government. The project was the brainchild of J.J. Walsh, a serving Government minister and former Chairman of the Cork GAA. The event was intended to represent a modern reinvention of the Aonach Tailteann, a legendary Irish version of the ancient Greek Olympics, first held at Tara in 632BC. The idea of resurrecting the games had been considered by Irish nationalists since the 1880s and the establishment of the modern Olympic Games in 1896 provided a template. With the coming of independence, Cumann na nGaedheal embraced the idea, hoping to use a massive celebration of native Irish sport and culture to project an image to the world of Ireland as a vibrant and successful sovereign state, which had rid itself of British rule. In addition, the games would serve another powerful propaganda purpose. Given that republicans still posed a significant threat to the stability of the country, the Games would serve to legitimise the authority of Cumann na nGaedheal as the proper, democratically elected government of the Irish people. The Government loaned £7,500 towards organising the Games – a substantial investment considering the country was effectively bankrupt following the widespread destruction caused by the War of Independence and Civil War. Given Walsh’s close connections with the GAA, the Association was heavily involved and Croke Park was redeveloped to host most of the track and field events. The Tailteann Games ran over two weeks from 2-17 August and offered a full programme of athletic, swimming and cycling events, along with various Gaelic games competitions. Over 140,000 people attended, making the Tailteann Games the largest sporting event in the world in 1924, even surpassing the Paris Olympics held a week previously. Indeed the Tailteann Games were purposely scheduled to coincide with the ending of events in Paris to ensure that many of the Olympic athletes stopped off to participate on their way home. The athletics programme alone included six Olympic gold medallists. In all 5,000 athletes, drawn from teams representing Ireland, Scotland, England, Wales, the USA, Australia, Canada, South Africa and New Zealand participated and entrants were restricted to those who could claim Irish birth or heritage. Among the more famous athletes who competed was the American Olympic swimming champion, Johnny Weissmuller, who later famously portrayed Tarzan in the 1930s films. Apart from sporting events, the Tailteann festival programme also included a wide range of competitions in literature, theatre, dance, art and music. As it was a celebration first and foremost of Irish sport and culture, Gaelic games were heavily represented and Walsh insisted that no ‘foreign games’ (i.e. cricket, rugby, hockey or soccer) be permitted. However, there was a curious exception to this. What drew the largest crowds were the modern, mechanised sports which were represented. The spectators which flocked to the Phoenix Park to watch the motorcycle and aeroplane races and those who went to Lough Ree to witness the speed boat events far outweighed those who attended the athletics or Gaelic games matches. Like the Olympics, the event was now planned in four-year cycles and the 1928 Games were held to coincide with the Amsterdam Olympics to again ensure a large representation of international athletes. 1928 mostly matched its predecessor in terms of crowds and the quality of sporting competition but already a cooling of enthusiasm for the project on behalf of the media and Government itself was evident. Amid growing concerns over the continued viability of the Games due to its mounting costs and the waning political capital being gained, the final Tailteann festival of 1932 was a noted failure. The staging of that year’s Olympics in Los Angeles meant there was no international or even Irish Olympic representation. The event was also completely overshadowed by Dublin’s hosting of the Eucharistic Congress earlier that year. Crowd numbers had dwindled alarmingly and the press increasingly viewed the Tailteann Games as little more than a parochial sports meeting. With the new Fianna Fáil Government of Éamon de Valera now in power, the decision was taken to jettison the project as it was seen to be too closely associated with the previous Cumann na nGaedheal administration. Yet despite its brief history, the Tailteann Games proved to be a key symbolic moment for the fledgling Irish state. It represented the first use of a major sports event to showcase Ireland internationally as a confident new democracy which, despite the previous centuries of British rule, had retained a proud and vibrant cultural identity. By giving people like Vincent Delaney a platform to display their objects from events like the Tailteann Games, the National Treasures project is bringing public attention to some of the most important, yet often unknown episodes in our nation’s sporting history. Dr Richard McElligott is a native of county Kerry and a lecturer in modern Irish history in University College Dublin. Richard has published widely on the history of Irish sport and also on the Irish Revolutionary period, 1912-1924. He is the author of Forging a Kingdom: The GAA in Kerry, 1884-1934 (2013) and editor of A Social and Cultural History of Sport in Ireland (2016).